– Scanning time arch 40 sec c.a. 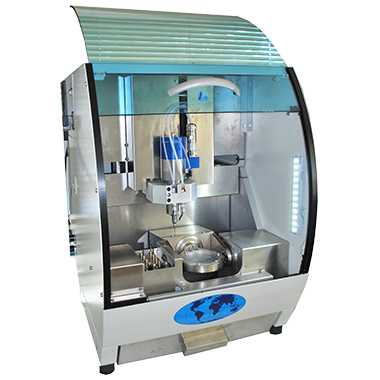 JOLLY the professional mini center for processing is a modular equipment with 4 or 5 axis, created to meet the requirement of the most ambitious practices and milling centres. It can carry out every type of processing on the following materials: Waxes, Zirconium, Pmma, Resins loaded with fibres, Compound materials, Disilicate, Pre – milled in titanium. The mechanical features, designed to ensure maximum reliability, are entirely made of carbon steel and aluminium. Axis come with crews and recirculating precision ball slide guides. 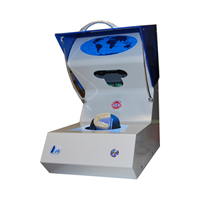 Mechanization is based on latest-generaton digital microstepper and the numerical controil is and ISO Standard. Tools are measured automatically by means of a digital pre-setting. Since the machine may process various type of materials, it is equipped with a lubro-refrigerant installation and a 8-position automatic tool changin system. 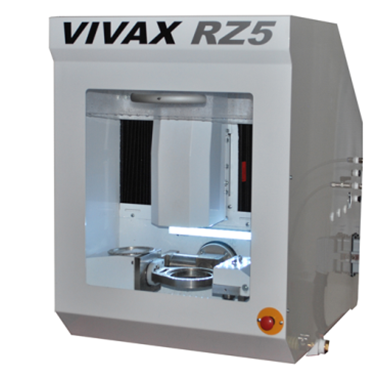 CNC Vivax RZ 5-axis in continuos, the structure and guides are made entirely in carbon steel, it is equipped with a lubro-refrigerant installation and an 8-position automatic tool changing systemThe machine can do wet or vacuum works and it’s indicate for fixed prosthesis and implant abutments. Structure: The cover is made by carbon steel coated with epoxy paint. 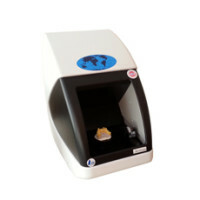 It completely isolate the mechanism giving the chance to do wet or vacuum works. Movements: For the linear axis are used guides and ball screws with no backlash, while for the rotary axis is used a precision gearhead also with no backlash. The movement is given by microstepper digital motors. 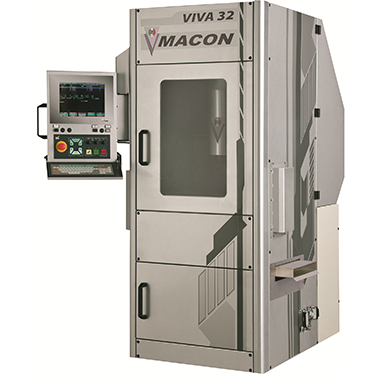 CNC laying on the ground with 5-axis in continuous, VIVA 32 has a configuration portal where all movements are given to the tool. All components are designed with the most sophisticated CAD system and analyzed with finite element method (FEM). The structure is made of welded steel, suitably ribbed, thermally stabilized and worked. It is essentially composed of three elements: the frame, the portal and the Z-axis slide. Axes move along rigid guides by means of ball screws guides, managed by a digital brushless motor. Specific liquid cooling system ensures a perfect efficiency for life. It’s indicated for the processing: fixed prosthesis and abutments. Materials: wax, all kind of plastic materials, zirconia, disilicate, feldspar, titanium and cobalt chromium. 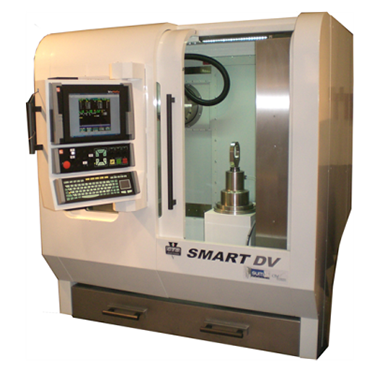 CNC laying on the ground with 5-axis in continuous,; Smart DV has a moving column configuration in which axis-C slide is given to the workpiece, while axis-A slide is given to the electrospindle. Particularity: Disk supporti is in vertical position. All components are designed with the most sophisticated CAD system and analyzed with finite element method (FEM). The structure is made of welded steel, suitably ribbed, thermally stabilized and worked. Then, CFC is very strong and compact. Axes move along rigid guides by means of ball screws guides, managed by a digital brushless motor. The automatic tool change of 30 positions ensures the efficiency and continuity of processing. Integrated presettings allows the presence tool programming cycle and the length measurement too. Smart DV can be supplied with a disks store of 20 positions, where a cartesian robot moves the same disks. Numerical control used has an ISO STANDARD programmation. 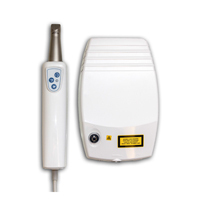 It’s indicated for the processing fixed prosthesis and implant abutments.